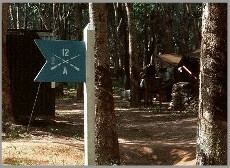 The Alpha Association - Dau Tieng Base Camp A Company, 2nd Battalion 12th Infantry Regiment, Vietnam. Colonel Elliott's message to the men of the 2/12th at Fort Carson. A Company, 2nd Battalion, 12th Infantry was formed at Fort Lewis, Wash. and incorporated into the 3rd Brigade, 4th Infantry Division with the intent of deployment in Vietnam the following year. The unit arrived in Vung Tau in October, 1966 and was originally based at Bear Cat, and later at Phuoc Vihn. The unit was finally deployed at a strategic outpost northwest of Saigon named Dau Tieng after Operation Attleboro discovers a major enemy operating area based in the Michelin Rubber Plantation nearby. Dau Tieng base camp became a major staging area for thrusts deep into War Zone C.
In January, 1967 a Medic from our Company displaying fearless gallantry in the face of murderous fire, heroically saved the lives of a number of our Brothers. He was lost in the action, but Donald Evans will always be revered by the men of A/2/12, for his bravery He was honored with the Congressional Medal Of Honor, posthumously. Donald was not only the first member of the 4th Division so decorated, but also the first Medic in the Vietnam Conflict to earn the medal. To view the Tributes to Doc' Evans, click here. Four months after arrival at the base camp, A Company , 2nd, 12th becomes a player in Operation Junction City, the largest operational thrust of the entire war. This operation utilized 22 battalions, as the attacking force. This gigantic force was supported by 17 artillery battalions and over 4000 Air Force sorties. An aerial Armada consisting of 249 helicopters were flown in this assault. This number remains today as the largest U.S. Army aerial assault ever undertaken, never again duplicated during this conflict or any future American assault in any war. During this Operation A Company was involved in the relief of Fire Support Base Gold which came under attack on March 21st, 1967. The camp was manned by 2 Infantry Companies of the 3/22 and an Artillery Battalion of the 2/77th, totaling 450 men. They were attacked by the elite 272nd Main Force Regiment of the 9th VC Division, reinforced by 2 additional battalions that raised the number of hostile forces to 2500 troops. The 2/12 was camped to the northwest of the battlefield and raced to join in the defense of the threatened units. Along the way an ambush was discovered overhead by one of the attack helicopters and an ambush was averted when an aerial bombardment of the trap was initiated. Upon arrival at the clearing, A Company cleared through the friendly's line and began a sweep to the north, relieving the pressure that the support base had successfully withstood for almost 3 hours with the help of the Air Force, flying 31 sorties around their perimeter. Within minutes of this sweep the 2/22 with their APC's and the 2/34th Armor arrived and the rout was on. That day the enemy dead totaled 647 troops killed. This would prove to be the largest one day battle casualty of the Vietnam War for the enemy. All participating units including A/2/12 received the Presidential Unit Citation for their heroic defense of the support base. The unit along with the entire 3rd Brigade of the 4th infantry Division was incorporated into the 25th Infantry Division in August , 1967, where it remained for the duration of it's participation in the Vietnam Conflict. It earned 10 campaign ribbons during it's deployment in country. The unit returned to Fort Lewis Washington in April, 1971. At that time it was in-activated and remained so until 1985 when it was reactivated and once more assigned to the 4th Division. In the early 90's it was retired for the last time. In March of 2000 original members of A/2/12 met in Thomaston, Connecticut for a reunion. At that time it was decided that an effort would be initiated to search for and locate all members of this unit. Since that time a number of former members were tracked down and have come into the fold but many more are still left to be found. I am publishing this web page with the hope of possibly locating some of these lost comrades. We would also be very interested in hearing from former members who served in this proud unit after we came home. Welcome home to all the troops from A/2/12. In May, 2001, Alpha Association celebrated it's first Grand Reunion. Fifty seven veterans from the unit and thirty seven of their ladies spent a memorable weekend together. Buddies who hadn't seen each other for decades finally had that chance to say "Thank you buddy, you were there when it really counted. I never forgot you". From it's humble origin in March, 2000, the veteran organization, Alpha Association, had grown in membership from 14 members to 240 members as of July, 2013. The only requirement to membership is the attachment to A/2/12 during the period running from December, 1965 to December, 1967. This year we celebrated our brotherhood during a reunion in Baltimore Md. We visited Fort McHenry where the 12th Infantry Regiment defended the fort during the battle of Baltimore and inspired Francis Scott Key to write our National Anthem. We also took the opportunity to travel to the Vietnam Memorial in Washington DC where we paid tribute to the fallen soldiers of our Company. As time passed and we had the opportunity to research our contribution in the Cold War, we came to realize that our Company was an historic and proud contributor in the effort to control the spread of Communism in the Third World. We served proudly and came home to an indifferent, if not hostile American Public. We remained silent as most of us reintegrated into society. There were so many stories of heroism that were left untold. Our Association is dedicated to assuring that the unit members receive their proper recognition. Author reserves exclusive rights to information displayed on this web site. This site Validates as HTML 5 and CSS 3 This page designed by Andrew Adamides.